While I was in Walnut Creek to take photos of an industrial park for a painting commission I stopped at the Shadelands Ranch Museum to sketch. They were hosting a ladies’ tea that afternoon in the downstairs drawing rooms that looked quite charming. I explored the rest of the house but sadly they told me I couldn’t sketch inside. I would have loved to draw the Walnut Creek Historical Society volunteers serving in white aprons, the fancy table settings, and most especially the gang of Red Hat Society ladies seated in one of the rooms. 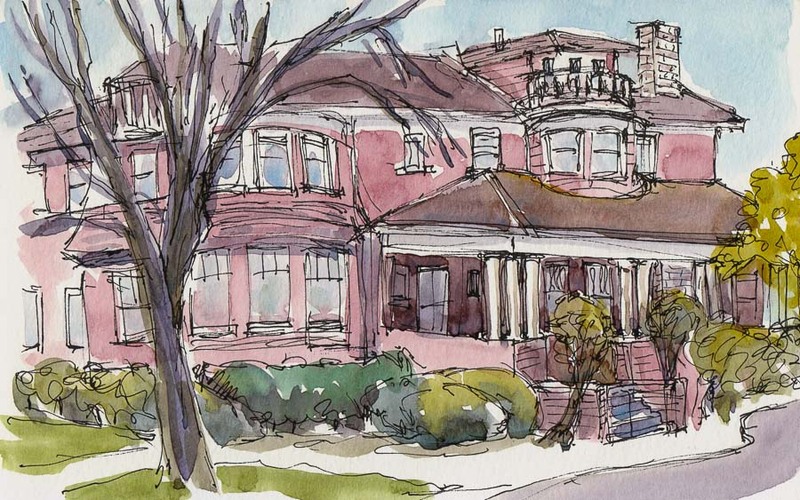 I waited outside and sketched the building, hoping to capture them coming out after the tea but they dawdled so long I had to leave or get stuck in rush hour traffic. 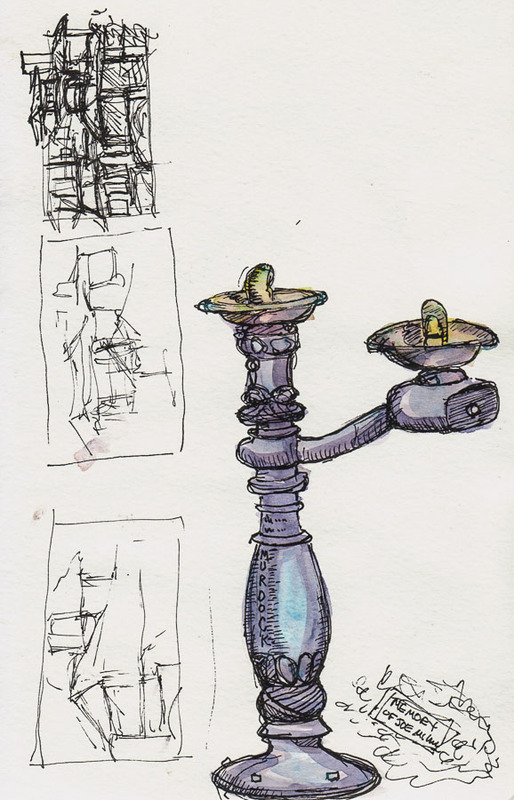 I drew this water fountain on the property to warm up before tackling the massive Penniman home. Then I did the three sideways thumbnails on the left to try to figure out how much of the house I wanted to draw and how I’d fit it in on the paper. Enjoyed seeing your drawings. What a shame they wouldn’t let you sketch inside. I wonder why, after all it isn’t invasive like a photograph! Still, there it is we have to accept these things sometimes don’t we. Beautiful, whimsical sketches, Jana. Shame (and odd) they wouldn’t let you sketch inside. That is a lovely sketch of the ranch museum. Did you have an opportunity to show them your work? I’ll bet they would love it! You did a great job capturing the oldness of the building with its windows and turrets.